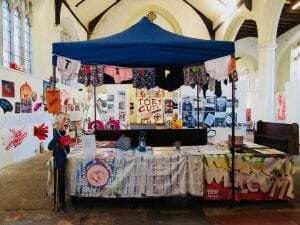 At last we have a belated annual round up setting out just a few of the things we supported and organised in 2018. DPAC was always set up so that if one person was ill or unable to take part in the day-to-day running of things it would still function but 2018 threw up more problems health and family wise for most of us than anyone could have envisaged. And although not all our problems are now solved we’re all still here and functioning – if a little slower than usual. Once again we want to thank our many supporters and allies for their help in many ways from attending physical and on-line events, producing memes for our use, donating to help us remain completely independent and help others to attend protests and meetings and a myriad of other things. Thanks once again to Paula, Louise and Keith for helping with stalls at a variety of events these not only raise money for DPAC but also promote us as an organisation. 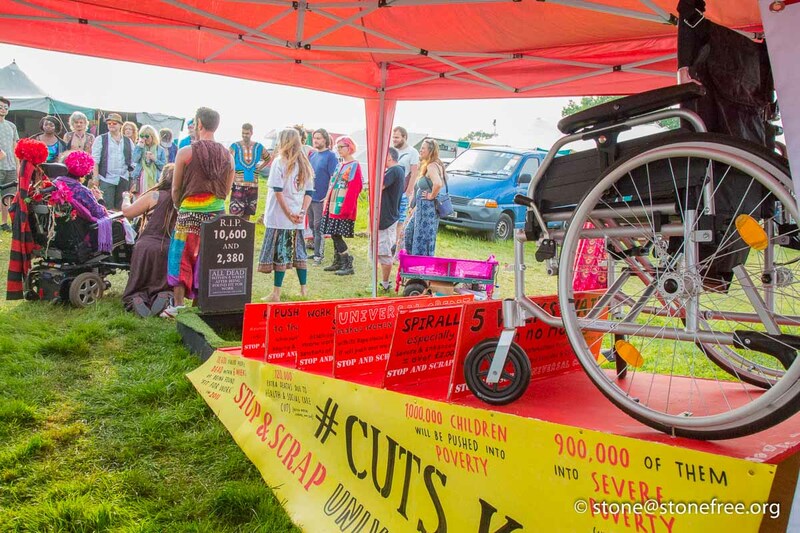 We’re very grateful to the disabled people who travelled so far to attend our Festival of Resistance during the summer and it was great to meet activists from around the world. As usual last year we were involved supporting a wide range of events and protests organised by ourselves and others where the impact would have a direct and negative effect on disabled people. 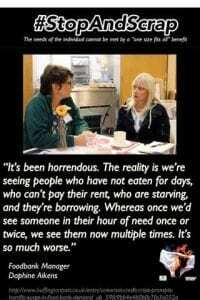 This included working with BASW and the Anti Austerity Action Group, RMT, Transport for All and ABC Commuters around transport issues especially driver only operated trains, Fuel Poverty Action Group, Winvisible, No More Deaths on Our Streets, Alliance for Counselling and Pyschtherapy,against IAPT therapies, Supporting NHS marches and anti-racists marches to name but a few. Members of the steering group have continued to speak at a wide range of events on various topics throughout the year. We’re grateful to them for giving their time and energy to do so and are proud to have them represent us at such times. Paula in particular seems to have been very prolific last year speaking at about 10 major events. 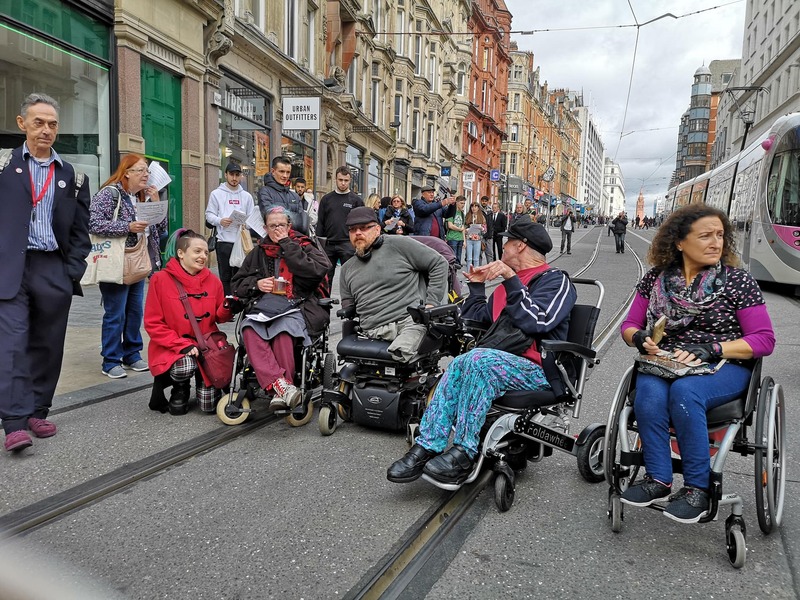 We’ve continued our work with the media and tried to highlight the ongoing injustices and problems that disabled people face in the UK today. We also had a voter registration drive for the mayoral and council elections because it is so important that disabled people do use their vote to seek change at all levels of the political spectrum. 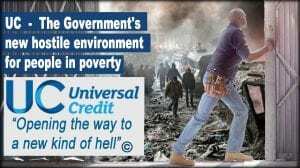 We organised High Court vigils with Winvisible and Inclusion London for the Universal Credit case against the loss of Severe and Enhanced Disability Premiums in UC. Fortunately the case was won although of course the government tried and failed to wriggle out of paying disabled people more. Most protests were supported by on-line actions and we also had an on-line protest against the Spring Budget. Sadly twitter has now stopped people using tweet lists and repeating others tweets en mass so we have been forced to change the way we can use it for protesting. We’ve produced several important papers last year as well as helping collect evidence for several consultation responses put together by Inclusion London. 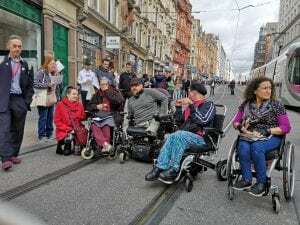 Papers include – an alternative solution to the UK independent living crisis? Independent Living Support for the Future. UBI: Solution or illusion? The implications of Universal Basic Income for disabled people in Britain. Our hard copy pamphlet on UBI will shortly be available to purchase at cost price of £1 although the report remains available on the website. And as well as providing supporting evidence for UK consultations Ellen collated Consultation responses: – Latest report to UN Disability Committee launched in Parliament on 25 October (submitted by UK DDPOs) which included evidence of continuing attrocities disabled people had experienced and which we had collated for this report. The UK is not only the first country to be investigated by the UN Disability Committee it is also the only country to be annually monitored. If only the Tories felt any shame…..
And Submission to UN Extreme Poverty rapporteur (submitted from ROFA). Paula was able to go to give evidence when the UN rapporteur met in East London and people from some of our local groups were able to attend local meetings with him especially Martin in Clacton. 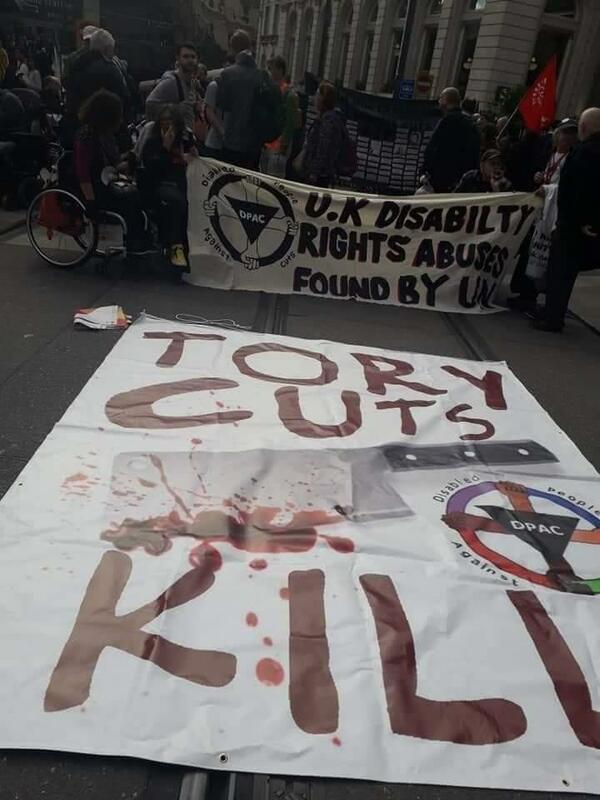 In July the Department for International Development headed by ex- Minister for Disabled People, Penny Morduant, tried to pretend that the UK government cares about disabled people’s human rights and to pretend through hosting a Global Summit that they were good at this. Naturally we felt the need to host our own events and held a Festival of Resistance to highlight the opposite truth and show those from foreign NGOs who attended what the abysmal reality is. It says much about the DfiD and their support for human rights that their co-hosts of this event were Kenya whose record on LGBT rights is so appalling. Amongst our guests were Rose Achayo, Feliza ali Ramos and Alex Marcelo Vazqiez Bracamonte from Bolivia, Antonios Rellas from Greece, John Clarke from OCAP and of course John McDonnell and we were joined by Skype by Naiaty Yaacob from Malaysia. It is also worth remembering the disgraceful way in which Disability Rights UK (DRUK) betrayed the disabled people’s movement toadying up to government at this sham summit. 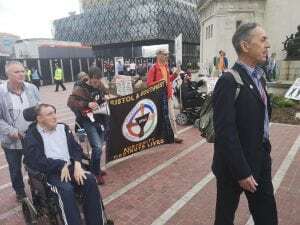 While work for this summit was the main piece of activism last year DPAC’s work to fight for disabled people’s human rights goes on daily both nationally and amongst our many active local groups. We were delighted that also in July at Unite’s policy conference one of our supporters, Ellen Morrison, gave a rousing and compelling speech in her capacity as a Unite delegateto ask conference to support Stop and Scrap Universal Credit which was carried. We continue our work to get this position formally adopted by Labour instead of the whimpish Pause and Fix stance the party currently continues to hold. Ellen’s superb and emotive speech can be viewed here. We’ve worked with Potent Whisper several times to support his rhyming guide to austerity and later last year on some video work with him that Paul and Keith helped with. Conference season again saw us busy with meetings and speaking at events at the Labour Party Conference and lobbying Margaret Greenwood, who seems to be largely silent on the hostile environment disabled people face which is unacceptable and must change, followed by our bi-annual trip to the Tory Party Conference in Birmingham. People from many of our local groups from around the country joined us there and it was particularly good to meet up with them all. We were also able to part sponsor an important disability art exhibition ‘I Protest’ in Norwich something a little out of the ordinary for us but which was a successful event and another way in which to spread information to the public. Also last year we undertook a major piece of research into the postcode lottery of social care and charging funded by a grant from Network for Social Change and we have asked Barbara Keeley the Labour Party shadow minister for mental health and social care to provide a room in parliament for the launch of both this research and our work on the future of social care. So far she has not responded however we hope to have a reply shortly. We’re still collating information on a few things mainly tell your story and on care charging and it would be helpful if anyone who hasn’t could fill in details on the website forms. This information is used for research, evidence, and media information so is vital to us all.